On 1 July 1955 Torsk joined Submarine Squadron Six based at Norfolk, Virginia where she continued her training activities by providing services to anti-submarine forces developing new ASW techniques. In the mid 1950’s, the Regulus Missile system was under development. Regulus was a jet powered, radio controlled pilotless aircraft that could carry a conventional or nuclear warhead. It could be carried on surface ships such as cruisers, and in specially designed hangers aboard submarines. The submarines would surface to launch the missile from rails on their main deck. In addition to several submarines outfitted as launch boats, additional units of the Atlantic and Pacific fleet were selected as guidance boats for the Regulus system. These boats would be positioned along the flight path of the Regulus missile, and would control the missile’s flight while it was in their designated area. 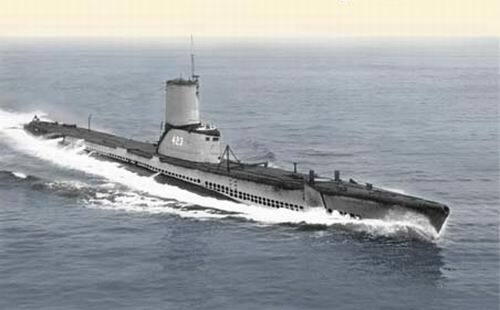 Torsk was one of the Atlantic submarines assigned to Regulus Guidance duty, and entered the Philadelphia Naval Shipyard in late 1955 for modifications and equipment upgrades to allow her to control the missiles. She participated in various training exercises over the next few years, until the Regulus system was discontinued in the early 1960’s. From June to August of 1959 she took part in the ceremonies marking the opening of the St. Lawrence Seaway during which time she made an inland cruise through the Great Lakes to Milwaukee, Chicago, and Buffalo. This cruise was called Operation Inland Seas and included Task Force 47, a total of 28 ships from the US Navy. More than a hundred thousand visitors had their first look at the submarine during the trip as they trooped through Torsk’s cramped compartments during port visits. Beginning on 19 August 1957 Torsk took part in NATO exercises operating with submarines of the Royal Navy. She was awarded the Presidential Unit Citation for operations during the 1960 Lebanon Crisis, operating as a unit of the Sixth Fleet in the Mediterranean Sea. She took part in the 1962 naval blockade of Cuba established by the United States during the Russian missile crisis. During the operation, Torsk sent boarding parties to inspect some Soviet merchant ships. For this action she won the Navy Commendation Medal. During the mid 1960’s, Torsk continued to provide Anti-Submarine training services to the surface fleet. She also made several cruises to places such as Ireland in 1965, and the Mediterreanean in 1966. On 4 March 1968 Torsk , at the ripe old age of 24, was decommissioned at the Boston Navy Yard. By that time she had made 11,884 dives, a very high number by today's standards. She remained in Boston until June of 1968, when she was assigned to the U.S. Naval Reserve as a pierside training submarine and towed to the Navy Yard in Washington, DC.